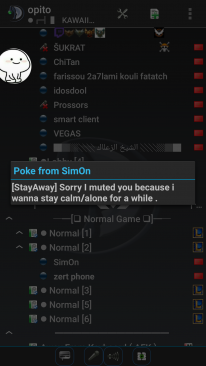 This plugin helps you to stay alone and calm .can move them back to thier channel ,mute them and they ll get unmuted when they left your channel or kick them out from your channel but if they wont stop ,they ll get kicked from server. it's all up to you. ( You are the only one who can move them to your channel ). StayAway Plugin v1.0 - move them back to their channel. - kick them out of your channel ( If they tried 3times or more, they ll get kicked from server ). - mute them when they join your channel and they got unmuted after leaving your channel. StayAway Plugin v1.1 - Fixed some bugs. - now it ignores who was already muted by you before joining your channel [On MODE MUTED THEM ]. - Removed some no needed/useless things.